Things to do near Cumberland, Maryland? I’m going to be visiting my dad near Cumberland, Maryland in the near future and I was wondering if anyone had suggestions for things to do in the area. We’re already planning to take the Western Maryland Scenic Railroad through the Alleghany Mountains. Choo, choo! I thought it might be interesting (and slightly creepy) to walk through the Paw Paw tunnel that’s part of the Chesapeake & Ohio canal. There’s no lighting, so you have to bring a flashlight. We might check out the new Rocky Gap casino or go to New Germany State Park. And…that’s about all we got. No one warned me the “falling water” would be happening on the walk to the house. 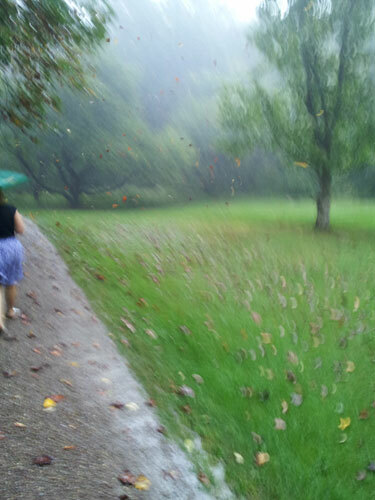 I’m not sure if the blurring was caused by the gusts of rain, or because I didn’t have a flash on. Either way, it’s a fairly good representation of how it felt to almost be blown to Oz. 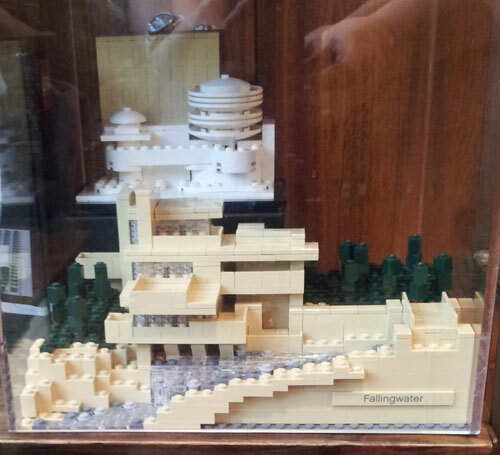 At least I was allowed to take a picture of the Lego version of the house in the gift shop. Anyway, if you have any suggestions, they would be welcome. We’d probably be up for a day trip that’s not farther than 2 hours away. Thanks! Ohhhh I love falling water. That was on my bucket list. When I went it wasnt raining but my kids were too young to go in so I had to leave them in the craft area and that was on my mind during the tour. So I wasted a bucket list item. Are you allowed do overs on bucket lists? Also I may or may not have honeymooned in CG. I am developing quite a list for my do over bucket list. Why did I read your post??? Western Maryland Scenic Railroad was wonderful. We took it yesterday. Enjoy! Have you gone to Deep Creek Lake? It’s about an hour away. Wisp Ski resort is there and they have non-ski season activities.There is a state park. And I’m sure there is a lot more that I am forgetting, but it’s been a few years since we have headed that direction. I think you would really enjoy Swallow Falls. It’s a beautiful state park with a 53 foot waterfall. I went to Frostburg State many years ago and my parents took me to the Falls during Parent’s Weekend. It’s close by in Oakland, MD. I’ve never been but I’ve heard that Firefly Farms in nearby Accident, MD is interesting. They are cheese makers and have lots of wine to sample. Hopefully cheese and wine aren’t headache triggers for you! Check out Deep Creek Lake, Seneca Rocks, and Dolly Sods – might be too far, but it’s really cool. Deep Creek Lake – Rent a boat, can rent tubes too. Swallow falls – she says this is fun, but the falls can be dangerous. I suggest reading guidelines online. And don’t do the natural water slides if there has been significant rain/high water level. She says the rocks are very slippery, so you have to crawl, not walk. Wear water shoes or sneakers. OhioPyle – rent bikes, beautiful 21 mile path. white water rafting place – haven’t done that yet either. @Chrissy – Is the regular walking path gone from Swallow Falls? It was such a nice, easy walk to get to the falls. @Mollie – she says that it’s not necessarily an easy, nice, regular path, but rather more like hiking. Visit Berkeley Springs, WV (NOT far from Cumberland–50 minute drive)–Roman Baths from the springs (you have to have an apt. ), “George Washington’s Bathtub”, amazing shops (adorable and quaint), the Observatory nearby has “Star Parties” on most Friday nights, an old Mom & Pop move Movie Theater and an awesome scenic overlook where you can see three states at the same time. They even have a CASTLE (privately owned, so no tours–but it’s cool). And I can’t forget–a cemetery (Dutch Cemetery) that’s haunted by a man who was lynched! Also Cacapon State Park is nearby with horseback riding and cool hikes.